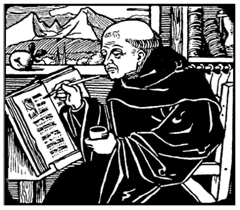 Medieval monasteries were the refuges for book copying during the Middle Ages. The burning of the library at Alexandria in the 5th century had been a terrible blow to humanity. Countless scrolls containing scientific, philosophical, artistic and mathematical knowledge were destroyed out of ignorance. Surviving documents were rare, and were often brought to monasteries to be copied for future generations. The Bible was certainly the most copied book of the Middle Ages. Not only was the Church interested in using these Bibles to spread its gospel throughout the land, these volumes were to be a veneration of beauty. Monks would often work in large rooms called a scriptorium, and only those working on texts would be allowed in this room. Monks became specialists. The antiquaries were masters of calligraphy. Rubricatores illuminated the large initials at the beginning of a page while miniatores illustrated the margins. Monks called illuminators painted intricate designs and biblical scenes on pages, to supplement the text. One of the most famous of these, the Book of Kells, was written around 800 a.d. and can still be seen in the library at Trinity College in Dublin, Ireland. Some monks made tremendous strides in changing the acceptance of non-biblical writing. Thomas Aquinas rattled the foundations of the Church when, instead of denouncing early Greek thinkers, he read ancient texts to reconcile their philosophies with Christianity. The illuminations also went against the convention of "never paint a picture of Christ." These illustrated scenes became masterpieces, and aided in the peasants' understanding of biblical stories.